One of the best DC motor to EV conversion is none other than the Warp 9 electric motor by NetGain. I have seen many DIY electric car enthusiasts, including Gavin Shoebridge of New Zealand using the Warp 9 DC electric motor for his homemade electric car. What’s so special about the Warp 9 model? I wanted to know the answer and decided to do some research on it. Firstly, there are actually 3 models of the Warp 9 motor. There are the Warp 9 Impulse Double Shaft, the Impulse Single Shaft and the Dbl 1.125” CE Shaft. Now, if you want to have a strong kick from your DIY electric car, the Warp 9 Dbl 1.225” CE Shaft is the model to go with. This particular model is ideal if you are thinking of getting a small truck or a large vehicle as your EV project donor car. One clear distinction of this model is its relatively large com bar and large GE style brushes. The com bars are more securely fixed to the arbor therefore making it less likely to lift. 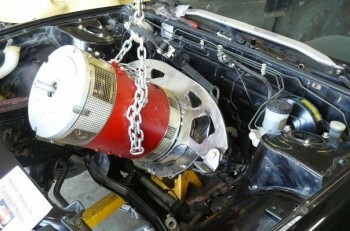 Size wise, the motor is 8.25” in diameter and 16.7” in length. Power wise, it has plenty. The Dbl 1.225” CE Shaft has a one hour HP rating at 28 HP at 89 volts. More than enough torque to get your EV to burn some rubber. However, the power offered by this Warp 9 model comes with a price. A closer look in Cloud Electric LLC inventory, an electric car parts supplier from Clarkesville Georgia, the motor is selling at $1,795.00. Some people may think it is a bit pricy, but once you felt its power, you’ll be happy you made the investment. With so many DIY electric car enthusiasts using this model, it is no wonder it’s the best DC motor for EV conversion. If you are thinking of getting one of this bad boys from Cloud Electric, click here. Want to know how to get started on your own DIY electric car conversion project? If you do, check out the Convert2EV e-book by Les Oke. Les has been driving a pure electric cars for more than 15 years and he knows the ins and outs of a homemade EV conversion project. The Convert2EV e-book is a compilation of his years of experience working with electric car. Click on the link below to get more information. DC Motor is Really best conversion of project i like it. Thanks, Will, but the “9” is out of my price range. I already hove a 9″ DC motor from a caterpiller forklift. It is brand new out of the box. It was for a 48V fork, but I was told it would handle 84V. I have a EV-1 controller set up for 0-84V.It all works in a 71 VW. I have a 50-0 olm pot for a throttle. So far I’ve onley been able to get 25 mph in 3rd or4th gear, needs more tweeking. I also have a compleat controller, motor and drive train out of a chev.Geo EV-1. I don’t have a doner car for it yet. I also have a nicad batt and controller out of a 2003 honda civic [no moter] I still need to learn how to charge the nicad batt. WISH ME LUCK!! I would like to do a conversion but don’t want to believe that I am paying twice, once for the parts and twice for the profit of the dealer. question: Why would a guy like White Zombie use 2 motors???? common sense would tell you to go faster. How much quicker could it be for all that expense,motor,controller and any other that I may of missed. 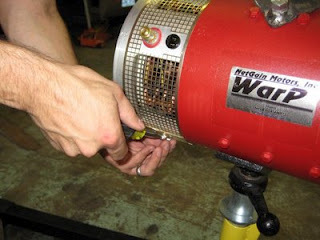 Thanks for sharing such a useful tip about Best DC Motor to EV Conversion Project – The Warp 9.. I am using a Netgain Warp9 with a Curtis 1231C controller for a 144volt system. I will use 24 6volt lead acid deep cycle golf cart batteries. Question is “What is the best way to charge and maintain my battery pack?” If you have a favorite Name Brand charger, please advise. I am just now ready to order my batteries and charging system so you timely reply will be greatly appreciated.